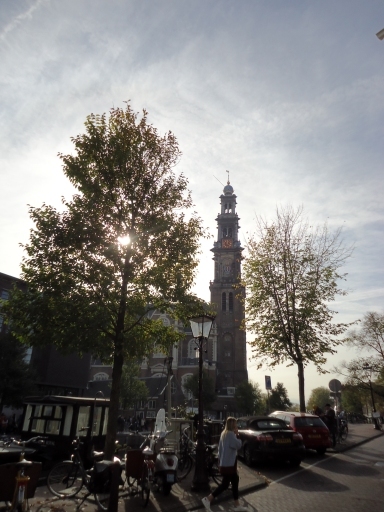 A few weeks ago I went to Amsterdam to see Nick, who moved there last year. James and Eppa also came along with kids Rene and Jack. Nick's flat is great: very modern (I loved the kitchen, even if the hob was too technical and confused me) and Nick's decorated it very stylishly (don't tell Eva I said that). Nick and Eva also did some great hosting and fed us very well. My favourite parts were the blackberry and apple crumble, the melanzane and getting to try Surinamese take-away for the first time (which is really popular in the Netherlands). A special mention goes to the stroopwafels that I bought to take home with me. I'd never had stroopwafels before and they are perfect. The hint of cinnamon with all that caramel? Oh my God. On our first day we went sightseeing, and walked (and trammed) around the city centre. By the bye, I should add that we also took the bus a few times but I was not impressed. 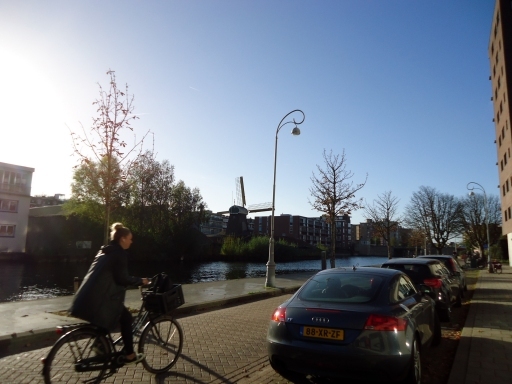 Amsterdam bus drivers drive like maniacs! On every single bus I went on I felt motion sick and had difficulty keeping upright (I have never been more glad to get on a London bus than I was on my journey back from the airport). 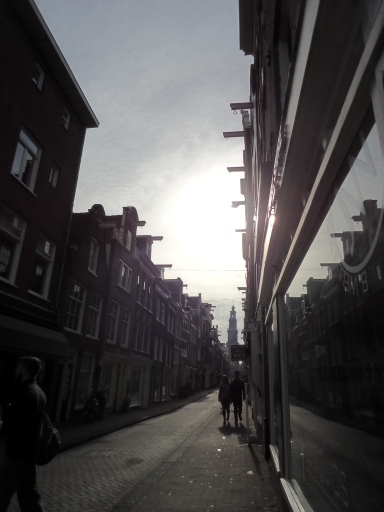 Here is the obligatory Amsterdam scene. Amsterdam is exactly like you'd expect: full of canals, full of bikes, and with the smell of weed around every other corner. Actually, there were two things I didn't expect, and I was probably an idiot for not expecting them. 1. Dutch gables. 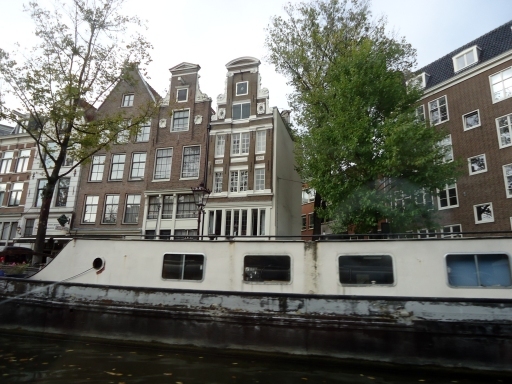 It had never occurred to me that Dutch gables would be such a significant architectural feature in Amsterdam. I mean, I knew they originated from the Netherlands (of course), but I never considered that they'd be on almost every single building! Look at all of them running down this street! Also in the photo you can see the hooks on the gables that allow loads to be lifted up to the top floor. The hooks are used so much that they're even built into modern buildings! That night we settled in for a pasta party (including the melanzane) and started preparing for the real reason for this trip: the Amsterdam marathon. On the second day of our trip, Nick and James ran the half-marathon and Rene (with Eppa) ran the kids' run. The start and finish were in the Olympic stadium, which was very busy with a real party atmosphere. There was music everywhere. Rene did really well in the kids' run: a sprint finish! 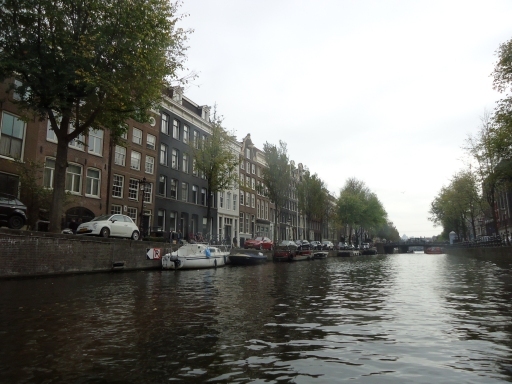 For Nick and James' run, we left them to it and went on a boat tour of the canals instead. Then we returned to the stadium see them finish. Well, I say see them finish. I missed Nick crossing the finish line because I'd gone in search of a portaloo. I also missed James crossing the finish line because although I was actually in the stands this time, I completely couldn't see him amongst the crowds. Whoops. Regardless, both Nick and James did really well to finish and I was impressed by how well they were able to have a normal evening afterwards (I would have collapsed into a puddle as soon as the run was over). That's what a good training schedule does to you, I suppose! I really enjoyed the boat tour. 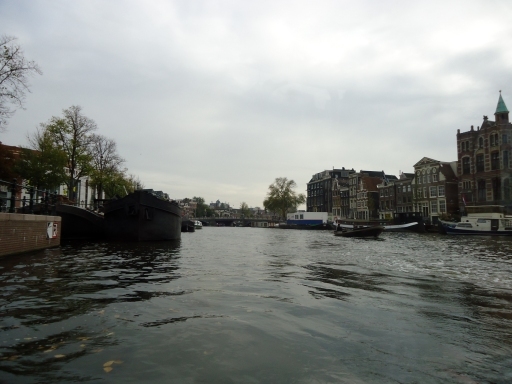 It was a great way to get up close and personal with the canals. 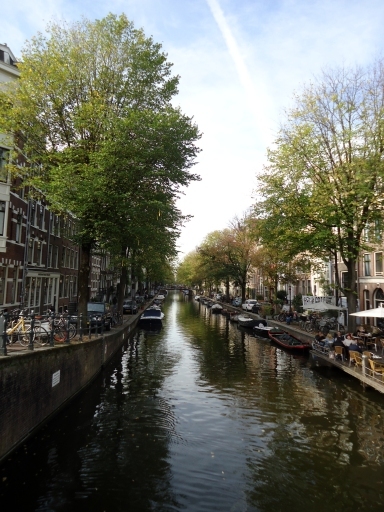 As Rene said, "Amsterdam has hundreds of water!" 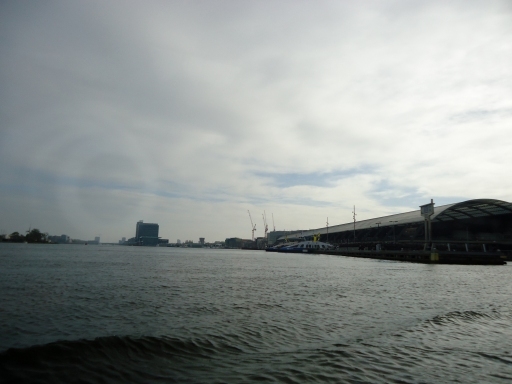 This was the view at the beginning of the tour when we pulled out onto the IJ. On the right there is Amsterdam Centraal Station. When you're in the station, especially the bus station at the top, the view over the water is impressive. Below are the rest of the boat tour photos. I can't comment on what they show, because I have no idea where we were. The buildings were so pretty though. I can't believe how many buildings dated from the 1600s! So many were slightly crooked and charming. Plus it was fun to see all the old building signs up on the walls. Canal? Check. Cyclist? Check. Windmill? Check. I enjoyed it! We’ll have to come back sometime.